Hey all! I'm super stoked to announce that Oakleaf Holt is reopen to new players! After two years of playing, we also finally have our own thread on the Scroll: here's anything and everything you need to know about Oakleaf! Oakleaf Holt is a forum-based, play-by-post game. That means that someone starts a story with one character, another continues it, so on and so forth. Our game currently consists of three separate tribes: Wolfriders, Go-Backs, and Wavedancers. More information will be given about them shortly. :) Oakleaf is a canon-based alternative universe, of sorts; our Wolfriders are a splinter tribe from Ember's, our Go-Backs are (distantly) descended from the original Go-Backs separated from the Palace by Rayek, and our Wavedancers...well, they're largely a mash up of canon and BMP. We DO have some characters who are related to canon characters, but we are NOT accepting more. Because of the nature of our game, we do not accept characters from non-canon tribes: cat-riders, bear-riders, hawk-riders, or anything not seen in canon is not seen at Oakleaf, though we would be happy to send you to some other holts with worlds where those characters exist! We have a monthly activity check, and we ARE fairly fast-paced; but we're also understanding of life happening. All we ask of our players is that they keep up in the threads they're in, and try to post a couple times a week, per character. Each player is allowed six (6) characters, two per tribe. Our plots rotate which tribe they're focused on: our first plot, which involved a corrupted pool of magic taking up residence in an old tree, involved the Wolfriders. Our second plot is about trolls taking revenge on the Go-Backs who took their home 85 turns ago. Our third plot will focus on the Wavedancers...what dangers await them? Something from the cold, dark depths of the sea? From the unexplored land? Or are the strange lander-elves who ride furred beasts with teeth like daggers the source of their strife? Come find out! Because our plots focus on one tribe at a time, that tribe is often the most played with; but that doesn't mean the other two tribes are ignored! Side plots are happening all the time. 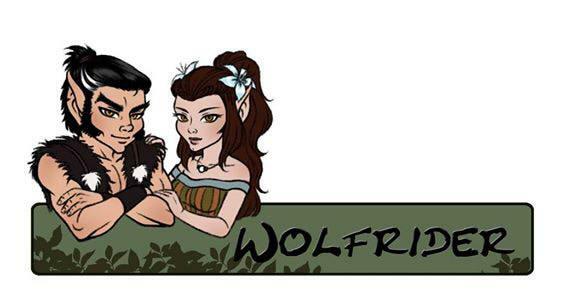 The Wolfrider tribe is led by Badger and Mistblossom, two elders who only recently became chiefs. The original chief Wolfdancer, son of Ember and Teir, Recognized the chieftess of the Go-Backs and could not choose between his duty to his tribe, and his duty to his lifemate and child. After a pool of corrupted magic tormented the Wolfriders, and trolls poisoned the Go-Backs, Wolfdancer realized he couldn't bear to be away from his mate, gave up the chief's lock, and left for the Go-Backs' lodge. Badger is a good-natured warrior with a sense of humor, and Mistblossom is a talented treeshaper; together, they work to make the holt a safe place to raise their first cub, due any time. After helping the Go-Backs with their troll infestation, however, they lost a quite few elves, but a new batch has made their way from Ember's tribe. Oakleaf is open to more! We have one (1) overflow spot available (see latest post for what an overflow spot is). 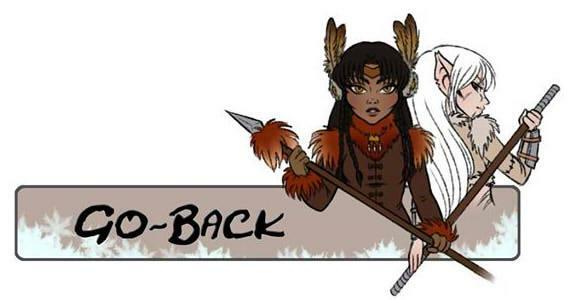 The Go-Back tribe is led by Sonia, daughter of Venka and Serj; Allegro, the albino metalshaper, her confidant and as much of a sister as she can be, even if they shared blood. Venka, looking for Kahvi with a young fawn in tow, found a roaming band of Go-Backs. She led them in name only for a time, but left to continue her quest when Sonia matured. The young female went to find her mother, and herself; after a hand or three of turns, she returned to a thriving, but road-weary tribe led by Allegro. The albino easily turned over the leadership to Sonia, who quickly settled the tribe. The peace didn't last long; little had they known that trolls lived under their new home, and a bloody war broke out, ultimately resulting in victory for the Go-Backs! Allegro's lifemate died, and the albino sank into skin after skin of wine, withdrawing from the tribe...in her drunken wanderings, she found Grimjaw, a curious, rough explorer of a troll who taught her to throw stones. Meanwhile, Sonia Recognized the young wolf-chief, who they came across when exploring the nearby forest. Allegro kept Grimjaw, and her addiction, secret from the Go-Backs for turns, but the troll became an unlikely ally when the few troll survivors from the last war, led by King Ironskin, returned for revenge. His plot resulted in the deaths of eight elves, but the Go-Backs were ultimately victorious, and four fawns are on their way to replenish the tribe. Life will soon go back to normal, but will the tribe ever trust Allegro again? And how will they react to the presence of a cocky ex-chief? The tribe has plenty of warriors, but they'd never turn anyone away. We have three (3) overflow spots available (see latest post for what an overflow spot is). The Wavedancers are led by the twin Crowns, Rhialee and Ailani. They're the fifth in their line, their title taken from the decorative headpieces each leader chooses when they take up leadership of the pod. Rhialee is the fun-loving, easy-going twin, and Ailani is more serious and reserved. The twins inherited their position when their mother, Fourth Crown Mahina, was killed in a devastating lander attack that took out half the tribe. Friends, families, and lovers separated, the twins made the hard decision to flee the scene with those who couldn't fight; they swam north, farther north than they'd ever gone, hoping for a place without landers or their accursed ships. For six moons, the Wavedancers have settled at their new pod; an uneasy, mournful cloud has since lifted, and the sea elves are starting to make their new beach home. While exploring their new territory, they stumbled upon a small group of Wolfriders, hoping to make their way to the great salty lake they'd heard about, but never had the chance to visit. The Wavedancers have also been blessed with a successful Spawning, a celebration of fertility and Recognition. The High Ones joined Brook and Spindrift, and their pending pip is already bringing hope of a new beginning...but could another be coming? Also joined were Leaena and Ailani, and despite the lack of pips coming from two females, their Recognition was equally celebrated. The Wavedancers are at their full strength, but Rhialee and Ailani would welcome fresh blood. We have four (4) overflow spots available (see latest post for what an overflow spot is). Oakleaf Holt ALSO has TWO OTHER GAMES, for the intrepid player who just can't get enough of roleplaying! These are other Alternative Universe games, using characters you already play in different worlds. One, called Elves of Fortune, features elves as pirates looting the high seas. The other, Poison Blues, is about a detective working to solve the high-profile murder of an actress...and wife of a mob boss. These games are only for people who are active in the main game! If you've read all that, wow, you're awesome! :) If you're interested in joining, check us out! Our intro post and list of ALL THE THINGS is HERE. If you have any questions at all, feel free to reply here, PM a moderator, PM me privately, or email us directly at oakleafholt@gmail.com. We'll be open until the spots are full; no deadline! But we expect the spots to fill up quick, so if you want to play, let us know! Thanks so much, everyone! I'm looking forward to meeting some new players and their characters! We just approved a new Wolfrider, Kehn, and a new Go-Back, Kellera! A second Wolfrider is in the works; there are still plenty of spaces left! How do you know? ;) PM me if you're interested! 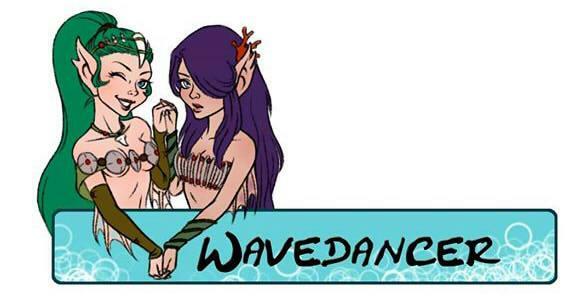 Congratulations to @Sofia, who just successfully adopted two Wavedancers, Rhialee and Lagoon! We're also on our way to approving our second new Wolfrider! Well she is a new character for me and a personality type I have not really played yet. ^_^ I look forward to some fun adventures. We've approved two more Wolfrider females, Vixen and Dusksinger! We've got seven unique new players who have yet to make characters, and eleven character spots left, so if you want to make one, now is the time! Hoo boy, a slew of new characters! Vesparose adopted Jes and Rux, and created Eveningveil and Lexm; we're also happy to welcome Tenderleaf, NoName, Fereng, Bane, Daryl, and Brea (last two soon to be approved)! This leaves us with one spot for a male in the Wolfriders, and one spot for a male in the Go-Backs (plus one adoptable). This will end our advertising push for now. However! We will not be closing the holt! Because of the interest we've seen in our game, we've decided to introduce something called an overflow spot. Overflow spots are opened when a tribe is COMPLETELY full; for example, our Wavedancers will be full once Brea is approved. Full means 20 active characters. Once a tribe is filled, four overflow spots will open. Overflow spots are not advertised, largely for new players, and prioritized for them. However, for that reason, a new player is entitled to only ONE overflow spot per tribe. If the tribe dips below 20, the overflow members will have the first crack at new spots. So if you stumble upon our game and you're interested, please let us know! We have room for you! If we don't, there are plenty of other great holts we can recommend. Our Wavedancer pod's overflow spots are open, but they will remain closed for the Wolfriders and Go-Backs until we get one more male for them, each. If you have any questions or want more information, don't hesitate to ask! Thanks for checking us out, everyone! Yay for all the new members! :) This will be interesting. Hey everyone! Here again to introduce some adoptables, and officially welcome Willow and Skyring to our game! I think that's everyone. O.O Overflow spots are officially open for all tribes! We recently tried to adopt out Wolfdancer, but it didn't work out. So we're trying one more time! Our ex-chief's had a hard time in the game, but the players are supportive and will do their best to help out whoever adopts him, so if his story intrigues you, please consider him! This is Wolfdancer with his mate Sonia, Chieftess of the Go-Backs. He's very young (only 35!) and still trying to find his place in the world...is it with the Go-Backs? Should he have stayed with the Wolfriders? Or is his place somewhere else? He's very proud of his heritage as the son of Ember and Teir, and has even inherited his father's magic, though with the Go-Backs, he's had little cause to use it. He's a skilled hunter, proud to a fault, can be selfish, and though he's often overzealous in his actions, truly has the best of intentions at heart. By the time of the beginning of our next plot (which is very close! ), he's been with the Go-Backs for two full turns of the seasons and has a son born just three seasons ago. The young Wolfrider has striven to fit in with his new tribe, but he still feels like he's walking on thin ice with some. He learned quickly that his place in the tribe was not by Sonia's side; at least, not in a leadership capacity. During her pregnancy, he did his best to trust her to tell him when she needed him, and he often escaped outside to his two wolf-friends to keep himself from gawking at whatever the latest thing Sonia did that showed the slightest risk to her or the cub. When his child was born healthy, he was relieved, and slowly started to realize that his mate truly did know what she was talking about! He revels in his role as a father, and harbors secret fantasies that his son will succeed as a leader where he failed...but he has to remind himself that such lofty aspirations shouldn't be thrust on a fawn so young. Shell is our second adoptable, a Wavedancer rockshaper! 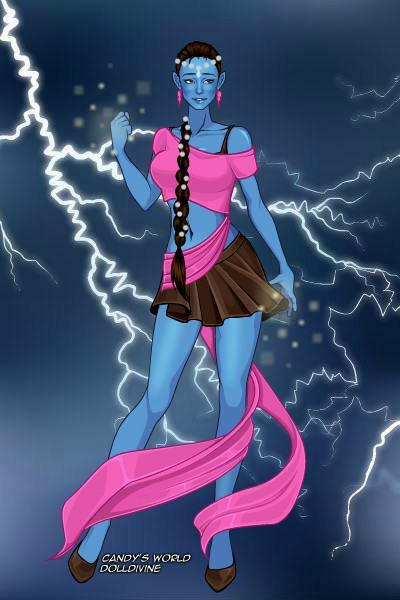 This blue-skinned beauty is well-grown, though she never grew out of her playful and flirty nature. Though she can come off a bit vain and unable to take things seriously, she's a talented magic user, can easily climb the cliffs, and isn't too shabby with a spear. With the recent births of Fin and Fairstar, Shell's had pips on the mind...but only as something for the future, she doesn't quite hunger for them the way some of the other females do. She has an on-again, off-again playmate sort of arrangement with Lotan, but her real interest right now lies in the caves just off the beach. What could she be hiding?